One of the many strengths of FooEvents is that it leverages powerful functionality that is built into the WooCommerce core. A good example of this is the way FooEvents uses WooCommerce Variable products to create different ticket types. For example, you may need to sell different types of tickets at various prices based on the area of the event that the attendee should have access to. Using WooCommerce Variable products, you can create different variations of the ‘event product’ which also act as different ticket types. In the following demo example we have created three ticket types; Seated, Standing and Golden Circle. Each ticket type is sold at a different price and the variation details will be automatically displayed on the attendees ticket as seen in the screenshot below. The use of variations is not only limited to ticket types but can also be used to specify which instance of the event the customer will be attending. 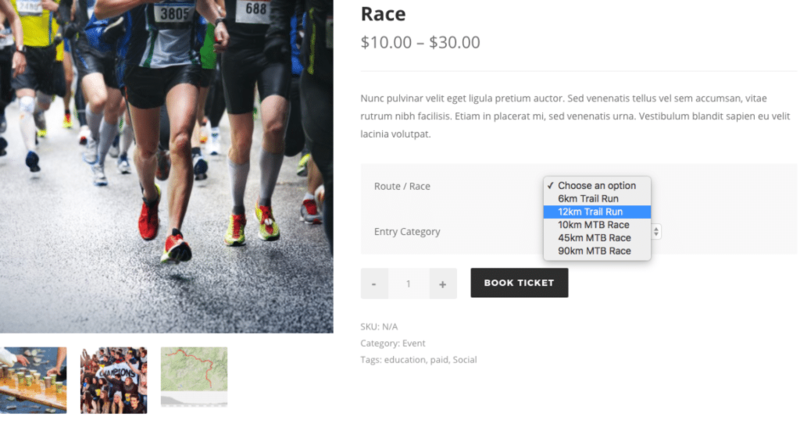 In the following demo example we have setup ticket sales for a sporting event and have used variations to allow attendees to choose which route they would like to participate in as well as which age category they fall under. This information will be captured and presented on their ticket. You can also export a CSV file that includes the attendees details as well as the variation/s they selected. Here are a few more examples of how variations can be used for different types of events such as a Food Fair, Church Fundraiser and Theme Park admission. You will need an active FooEvents for WooCommerce license installed on your WordPress WooCommerce website. 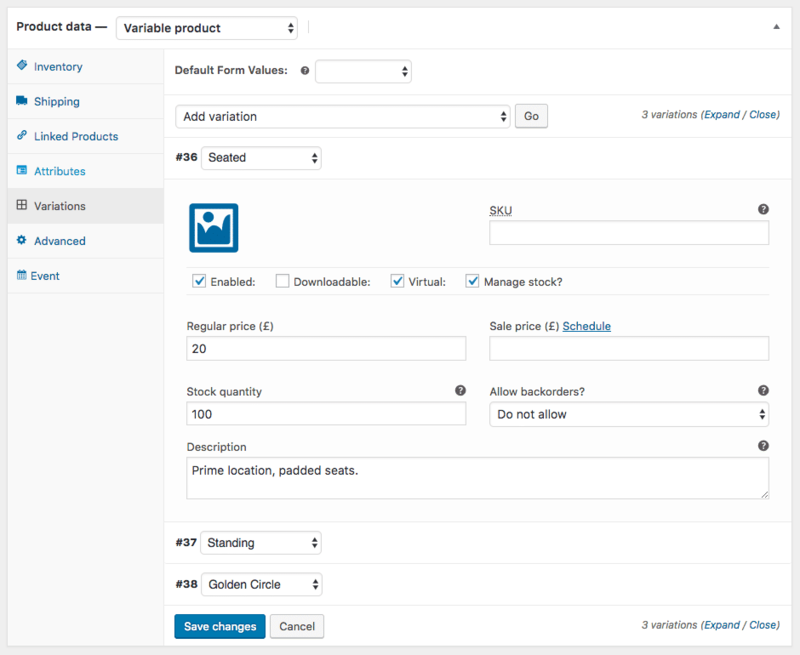 Go to ‘WooCommerce’ > ‘Products’ and open your event in the WordPress Admin Area. Select Variable product from the Product Data dropdown. Go to the ‘Attributes’ tab and select ‘Add’. Enter the name of your Attribute which will act as the label for your variation. This can be any name as all variations will automatically be displayed on the ticket and ticket/attendee CSV export file. In our example, we will simply call it ‘My Ticket Type’. In the values section, specify the variations that you would like to offer. Use a pipe symbol (‘|’) to separate them. Make sure you have selected the ‘Used for variations’ checkbox. When you’re finished remember to save the attributes. Attributes essentially layout the framework for your variations. You will now need to specify the details of each variation. In order to do so, go to the variations tab and select ‘Create variations from all attributes’ and click ‘Go’. This will generate a variation for each value you specified when creating the attribute. Next you will need to specify the details of the variation/ticket type. Make sure that you set each variation to ‘virtual’ as this will ensure that the tickets are sent as soon as the order is marked as complete. If there are a limited number of tickets available, select ‘manage stock’ and specify the number of tickets that you would like to offer. Save the product once you have completed the details for each variation. You’re done and can now view your event! Each variation will display in a drop down list. When a user changes the selection, the price and description will change accordingly. Users can add a single ticket or a combination of tickets to their cart. We hope that you found this post useful and we would love to hear your thoughts so please leave a comment below! If I use Partia.ly with WooCommerce to allow for deposits and payment plans at Checkout, will that also work with FooEvent items? Can the button text “Book Ticket” be changed? If so, does it work only for all products together, or for products individually? Apologies for the delayed response. Your comment got caught up in our spam filter. If you still need help with your pre-sales questions please send our support team (support at fooevents.com) an email and they will be more than happy to assist!